Aqua-Flow™ / 90 Veg Caps - Nature's Way®. 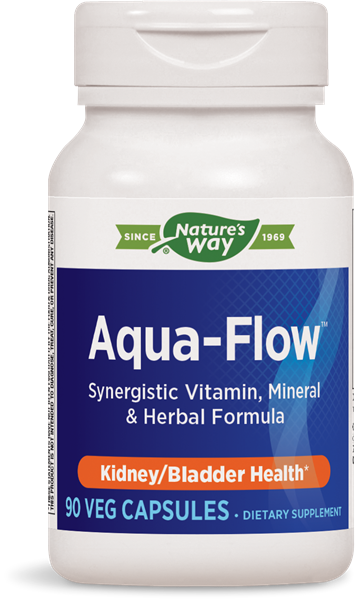 Can I use Aqua-Flow if I have kidney stones? There are no known contraindications for use of this product by a person who has kidney stones. However, it is always recommended that consumers keep their healthcare practitioners informed of any dietary supplements they may be using. Will I have to urinate more often when I take Aqua-Flow? Aqua-Flow does not cause a feeling of urgency or significantly increase the number of times you urinate daily. But most consumers report that they do pass a greater amount of urine. Do not use if pregnant, nursing, or under 12 years of age. This product should not be taken for more than 14 days continuously, unless otherwise directed by a healthcare professional. Persons with allergies to plants of the Asteraceae (Compositae) family, including ragweed, should use this product with caution. If taking any medications, or have kidney disease, consult a healthcare professional before use.